The Swan 1 was our original putter and it would fly straight for anyone right of the shelf. Since we had such good feedback we decided to produce the Swan 2, the exact same feel as a Swan with a better flight. The Swan 2 holds the line a little better and can be used in the wind with success. The Swan 1 was designed to give lower arm speeds a straighter putting line, the Swan 2 will give all players that long straight putt they have been looking for on the course. 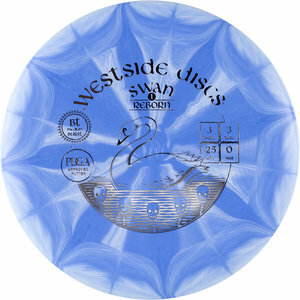 Westside Swan 1 Reborn is a PDGA approved disc. Grippy putter without fade, more understable than Swan 2.